This is a guide to converting Oldrim mods to work in Skyrim SE. It is geared towards novices with little to no knowledge of the process. 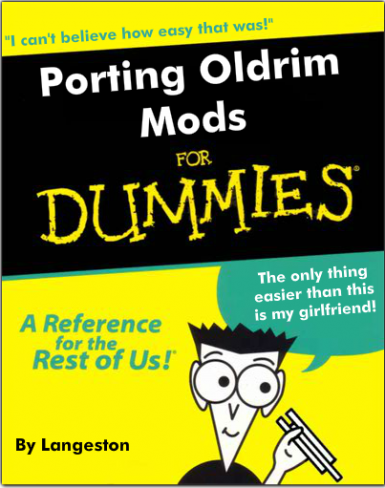 When I first started modding Skyrim SE, I had to bounce around from site to site and piece together the information needed to properly port Oldrim mods. While the information was definitely there to be found, it wasn't always particularly accessible, and much of the time the instructions seemed like they were geared towards people that already knew how to do it. It was frustrating. Now that I know what I'm doing, the process is trivial; I don't even have to think about it. But I know there are people out there that are just as clueless as I was, so I figured I'd write this up. This guide is intended to be super dumbed down, so people that are at the level that I started out at can understand it. If it seems long winded, that's because I wanted to cover all of the bases. The process itself is actually pretty simple though, trust me. Once you do it a few times, it will become second nature. I have used the following process to successfully port dozens of mods to Skyrim SE without issue. This guide is based on sound information I have gathered while learning how to mod Skyrim SE for myself. I personally have had no issues with the following methods, and if you read and understand this guide fully (including the documentation found in the links I have provided) you shouldn't have any issues either. That being said, I cannot be responsible for user error, acts of God, etc... It is to be understood that use of this guide is at your own risk. 1. This process will work for almost any mod, including mods that require SKSE. The only notable exceptions are certain SKSE mods that install a DLL. In some cases, the DLL may have to be modified/recompiled. 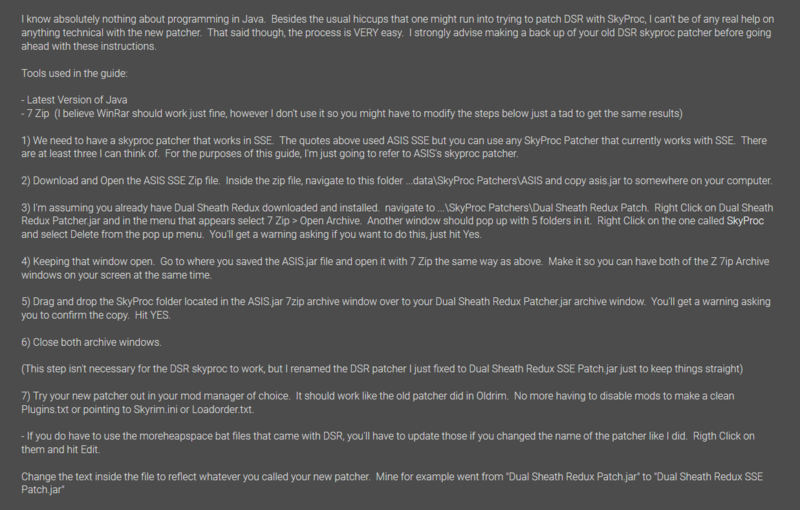 If the mod you are porting contains a SkyProc Patcher, please read "Addendum 2." 2. When you port mods from Oldrim, it is advised that you do so one at a time. That way, if you run into issues, it will be easier to pinpoint the source of your problem. Running off, porting 20 mods and installing them all at once is a bad idea. situations like that, just follow the process outlined below, and you should be fine. 4. While not a common source of trouble, (pretty rare actually, but it does happen) there are some situations where certain texture files can cause issues. Textures in the A1R5G5B5 and/or the B5G6R5 format in particular can crash SE. TGA files are incompatible too, but they won't crash your game as SE simply ignores them. I have only ported 2 mods that had these issues, but I feel that it is something you should be cognizant of. NifScan is a command line tool capable of detecting these files and converting them if necessary. Before you read ANY further, please read ﻿"Things to know when converting standard mods to SSE." I consider it to be required reading. Bethesda Archive Extractor (BAE) - (Standalone executable. No installation necessary, simply unpack to a safe location.) BSA archives packaged by the Oldrim CK are in a format that is incompatible with SE. In order for SE to read them properly, they must be unpacked. BAE is the tool we use to do this. Creation Kit Multiple Masters Fix - (INI file. Download CreationKitCustom.ini and copy it to your Skyrim SE directory.) Allows you to load plugins that have multiple master files. ConverttoSkyrimSE.bat - (Batch file; usage instructions are on the page.) This file, when used in conjunction with the HavokBehaviorPostProcess.exe tool from the CK, will convert any Oldrim animations (.hkx files) to the newer format that SE uses. SSE NIF Optimizer - (Standalone executable. No installation necessary, simply unpack to a safe location.) This tool optimizes meshes from Oldrim to make them more compatible with SE. Please make sure to read the documentation before using it, it's especially important for this tool. It may not be necessary to use for the mod you are converting; often, Oldrim meshes work just fine in SE. Please also keep in mind that it is not infallible, and in some cases has been known to cause issues. This post (specifically the parts by jonwd7, the maintainer nifskope) goes pretty in depth about its potential pitfalls. Conversely, Arthmoor has said this about it: "In handling meshes, it's definitely desirable to run them through Nif Optimizer. The new format is more streamlined and performance friendly so that's something most mods will benefit from when ported." All said—it is a useful tool if used correctly, and so far I personally have not had any issues with it. 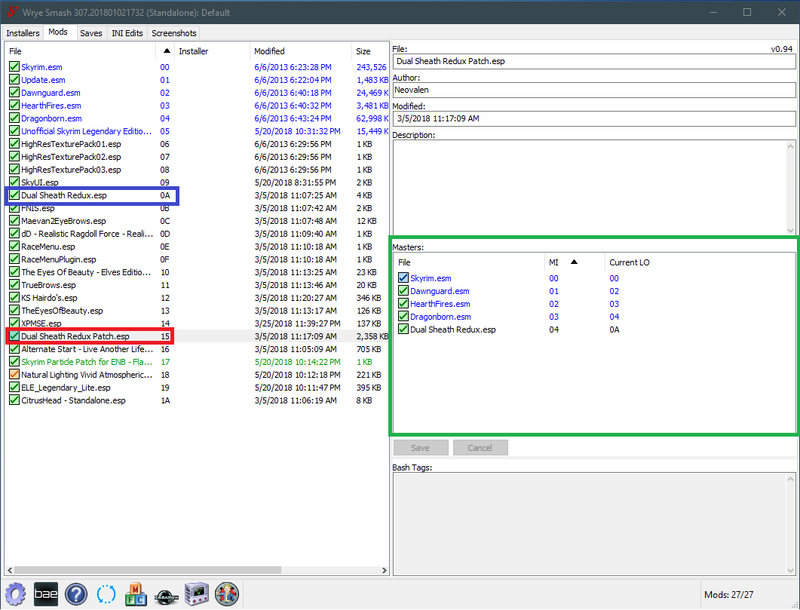 SSEEdit - (Unpack to your Skyrim SE Directory) If you are converting a mod that contains an ESM, this program is required to convert it to an ESP so the CK will allow you set it as active. It is also a very useful tool to have. Download and install all of the above necessary programs. If your mod contains a BSA, the first thing you need to do is extract it. If you have already associated BSA files with BAE like I recommended above, all you have to do is double click it and it will open in BAE. Otherwise, you can open BAE and simply drag the BSA into the BAE window. 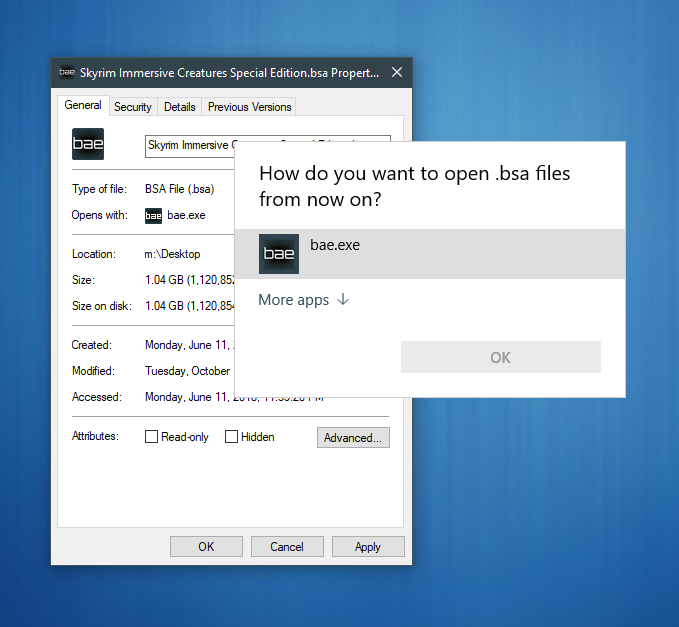 Click the extract button, and direct the contents of the BSA back into the project folder. You can now delete the BSA, as we are done with it. If the mod contains any animations, now is the time to convert them. Take "ConverttoSkyrimSE.bat" and "HavokBehaviorPostProcess.exe" and copy them both to your project folder. Double click on "ConverttoSkyrimSE.bat." After the automated process finishes, delete "ConverttoSkyrimSE.bat" and "HavokBehaviorPostProcess.exe." Optional and/or Potentially Unnecessary: (see notes on NIF Optimizer above) To optimize/fix problem meshes, drag NIF Optimizer.exe into the project folder and run it. Unless the mod you are converting has head parts (i.e. eyes, face meshes, etc.) you won't need to change any settings. If it does have face parts, then you will want to separate those files and selectively optimize those meshes with the "Head Parts Only" box checked. Wearable Lanterns does not have face parts, so just click the "Optimize" button and let it run. When it finishes, you can close out of NIF optimizer and delete both "SSE NIF Optimizer.exe" and "SSE NIF Optimizer.txt." Note: Repacking the loose files into a BSA is not technically necessary, but I recommend doing it for a number of reasons, a few of which are: A) This is how the SSE engine was designed to function, B) SSE reads BSAs faster than loose files, C) BSAs reduce disk usage, D) BSAs load in the same priority as their plugin, reducing unforeseen conflicts (i.e. mods that change NPC appearance causing the "Black Face Bug") E) BSAs keep the files neat and tidy. Here is a post that goes into further detail: BSAs and You. If you choose not to repackage the mod as a BSA, you can skip to step B-6. Click "Edit" and select "Check All Items." 7. Install the newly packaged mod with your mod manager of choice. (Please see "Addendum 1" if the ESP you are porting has ESPs as masters, as there are a couple of extra steps you will need to follow. If you are unsure of whether or not the ESP you are porting has ESPs as masters, then read "Addendum 1.)" Open Creation Kit, and when it is done loading, click "File"->"Data." In the window that opens, double click on the plugin you wish to convert, click "Set as Active File" and then click "OK."
It will take a while to load up, and it will spit out numerous errors. You can ignore those. When it is finished loading, simply click "File"->"Save" and close CK. Your ESP is now saved in form 44. At this point, the mod is fully installed and converted. 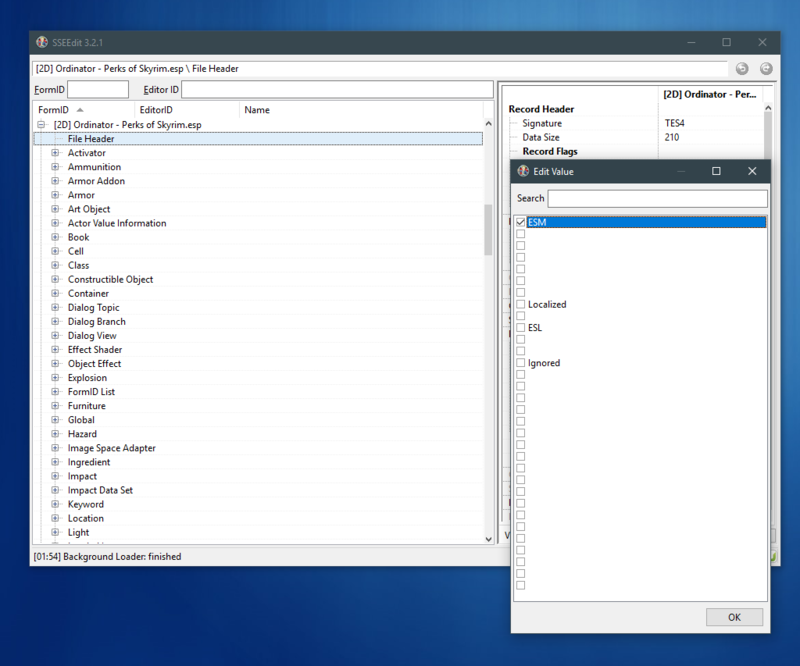 Right click on the field next to "Record Flags", select "Edit", and uncheck the "ESM" checkbox in the list that appears. Close SSEEdit, making sure to save the plugin. Open your data folder, navigate to the plugin, and change the file extension from "ESM" to "ESP." click "Set as Active File" and then click "OK."
"File"->"Save" and close CK. Your ESP is now saved in form 44. Go back to your Data folder, change the file extension back to ESM, then reopen SSEEdit and revert the changes you made in step 2. Exit SSEEdit and save the plugin. At this point, the mod is fully installed and converted. Congratulations! You're done, that's all there is to it; you've just ported a mod! Open Wrye Bash, click on the mods tab, locate the ESP you are converting, and select it. In this case, I am using "Dual Sheath Redux Patch" (red outline) as an example. Look in the "Masters" pane (green outline.) "Dual Sheath Redux Patch.esp" has 5 masters: Skyrim.esm, Dawnguard.esm, Hearthfires.esm, Dragonborn, and Dual Sheath Redux.esp. Plugins that are flagged as masters will be listed in blue text. If all of the masters names in this pane are in blue text, then you are good to go- you may continue to step C-1 above. If they are not all blue, proceed to the next step. In our case, "Dual Sheath Redux.esp" is not in blue. To change this, right-click "Dual Sheath Redux.esp" (blue outline) and select "Emsify Self." Read the warning and click OK.
You can now go back to step C-1 and continue the guide. I hope this guide was helpful. Let me know if you have any questions or suggestions.